John Lewis Krimmel immigrated to the United States only a year before composing this scene of the market stalls of Philadelphia. With its fascinating contrasts of race, social and economic class, age, and character, Pepper-Pot reveals the artist's delight in his new environment and captures Philadelphia's unique charms. This is the first oil painted by one of the earliest American genre painters and it is equally exceptional for its depiction of a freed person of color at work in the city. Placed at the center of this composition, the soup vendor, known through many early nineteenth-century accounts of Philadelphia, would bellow to passersby, "Pepper pot, smoking hot!" Pepper-pot, smoking hot,” was a familiar cry heard on the streets of Philadelphia in the early nineteenth century. Residents and visitors alike described the numerous African American women who sat in the famous market stalls that ran along High Street (now Market Street), enticing passersby to purchase the spicy soup. Unique to the city and invented by African Americans, pepper-pot combined African, Caribbean, and local flavors; it was an inexpensive meal that appealed to a diverse population. In his treatment of the subject, John Lewis Krimmel captures the vitality of Philadelphia’s marketplace, displaying the sharp eye for observation that earned him recognition as the first significant genre painter working in America. Krimmel painted this scene two years after moving to Philadelphia from Ebingen, Germany. As an immigrant, he was fascinated by the contrasts in race, social and economic class, religion, and attitude that he encountered on the streets of the city. The assortment of character types that appear in this work would become common in Krimmel’s other well-known paintings. Here the barefoot African American woman in the center grounds the composition. Her warm presence brings together a disheveled old soldier (still wearing his Revolutionary War uniform), a watchful elderly woman, and a gawky young country fellow, all of whom sharply contrast with two elegantly dressed girls who observe the scene with apparent apprehension. 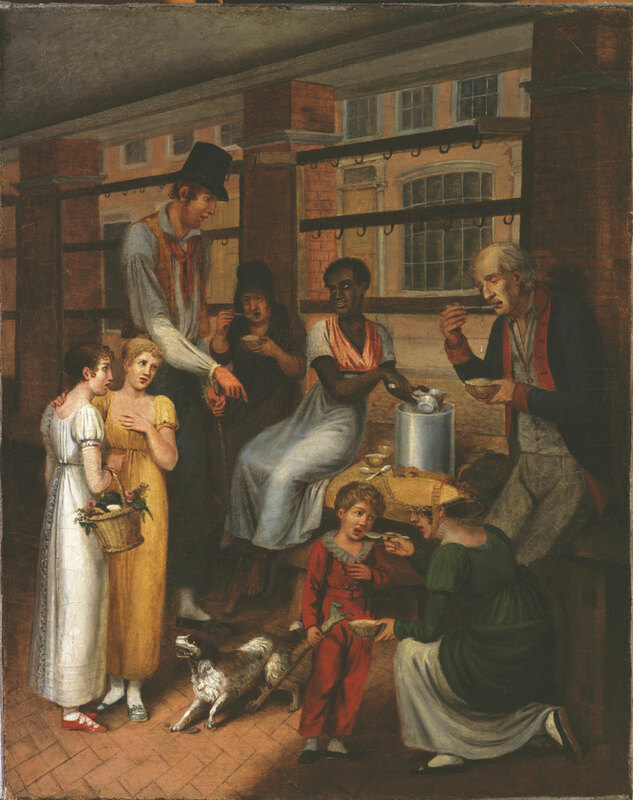 Exhibited in 1811 at the Pennsylvania Academy of the Fine Arts, Krimmel’s Pepper-Pot was one of the earliest narrative scenes to depict a freed person of color at work in the city. Unfortunately, the painting was out of the public eye for many years before being rediscovered in the 1990s. As the earliest surviving oil from an artist whose work influenced the next generation of American genre painters—including William Sidney Mount and George Caleb Bingham—the painting is a fascinating view of early nineteenth-century Philadelphia, making it an exceptionally important addition to the Museum’s collection. Audrey Lewis, from Philadelphia Museum of Art: Gifts in Honor of the 125th Anniversary (2002), p. 46.